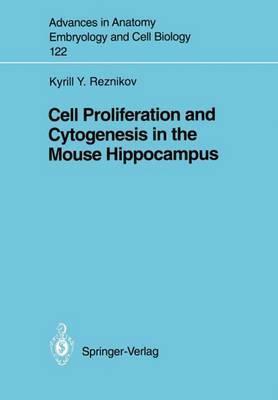 In the present work, processes of cell proliferation, cell death, neurogenesis, and gliogenesis in the mouse hippocampus were studied. The mapping of distribution of hippocampal mitoses and counting of their number allowed a more precise definition of the data concerning the disposition and age reduction of proliferative sites in Ammon's horn and the dentate gyrus in the mouse. As a result, the following generalized scheme of development and age reduction of the germinal zones in the mouse hippocampus has been suggested. 1. Ammon's horn a) The ventricular zone, from the beginning of formation of the hippocampus (Ell) until E20 b) The suprafimbrial zone, from El6 until P7 2. Dentate gyrus a) The prime germinal zone ("the anlage of the dentate gyrus" of Stanfield and CowanI979b), from E15 until P3 b) The proliferative zone of the hilus, from P3 until Pl4 c) The subgranular zone, from P3 until adult age The adduced scheme needs some comments: 1. In the hippocampus (as well as in other formations of the developing brain), primary precursors of all types of cells of neuroectodermal origin are represented by cells of the ventricular zone. They give rise to cells of secondary germinal zones in the dentate gyrus and Ammon's horn and are direct precursors of the majority (if not of all) neuronal cells in Ammon's horn, the earliest originating generations of neurons in the dentate gyrus, hippocampal radial glial cells, and, evidently, of a considerable part of astroblasts and oligodendroblasts in Ammon's horn.